Oh the joy, my first painted miniature in ages! 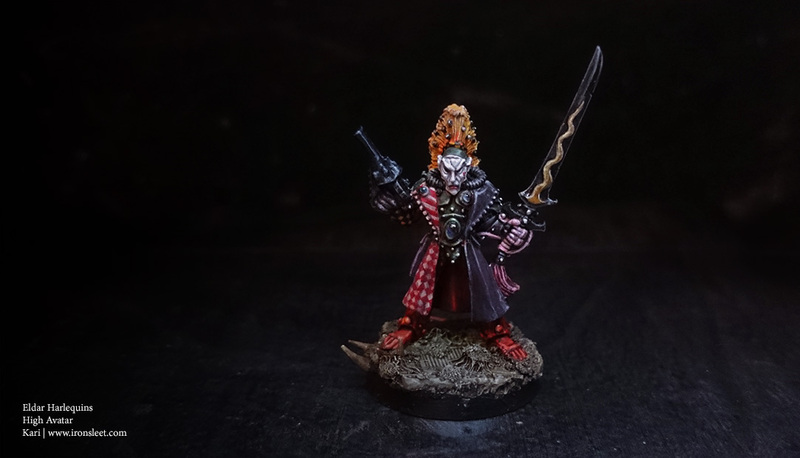 This one must be the most colourful piece I’ve ever painted… Eldar Harlequins High Avatar circa 1988, Oldhammer some might say. They still are charming, aren’t they? I had to wrestle with this one quite a bit, I must admit. No wonder since it’s been more than two months from the last painting session. But that wasn’t the only thing bothering me. In case of Harlequins it’s usually the freehanding that some people find hard to come up with. To me it is rather everyday yoghurt and even though I’m not the most accurate in it, I think I can manage. But the thing is, the damn colour-minimalist that I’ve been force feeding for quite some time has stuck in me pretty hard and deep. In the case of colourful Harlequin I felt like I was rebelling against my very core when using much broader palette than before. It felt – illogical. Because of this mental struggle the first couple of evenings felt like everything I did was a total failure. The paint job I did was out of place, detached from the concept I had in my head. Weird colour themes and patterns vibrated wildly in my retinas making no sence what so ever. During the last one third I became aware of what I was supposed to do and found the solution for my problems. I used Photoshop to sketch some colour schemes and vóila, I was back on track. From there on the thing was a pure joy to paint. Great paint job, Kari. Love the stark contrasts between black areas and the red/white checked ones. The addition of orange hair and a spot of purple are great little gimmicks to add flavour. Fantastic! Thank you JRN! It was challenging to find good contrast without going way over the top. Lovely. You’ve managed to strike the perfect balance between flamboyant and gaudy. Love it. It’s bright and grim and you can almost feel the weight of responsibility sitting on his shoulders. The fact you quoted Chesterton as well made my day. Bigtime oldschool, awesome. It looks like the check patern could use some shadow and highlights. Cheers Jens. You’re probably right about the checker pattern. I may fix it when I get back on painting these. These miniatures are so classic; you’ve done a great job of painting this – even more so as you’ve not painted in ages. To just be able to turn talent like that back on is amazing. I love the muted tones. Looks superb. Are you going to be painting more from the same series? That black sword ❤ great job mate!!! What a treat! Would be amazing to take a buddy pic with my Solitaire. There is a fitting and amazing Slaaneshi vibe to the scheme and like I said earlier, your style is just so epicly fitting for the old school models. I’m also grateful for the fresh palette that has forced you to keep that devlan mud coffee filter wash mostly in the closet. Cheers Migs! Seeing these two next to each other would be mind blasting! There’s still a hint of Devlan there, just a little bit 😀 Old habits die hard. Next Post Illuminati Terra – Everything you have been told is a lie!